No, your vacation penthouse does not come with a catering service included, but for those of you who prefer, or love to cook, catering to your culinary needs is a breeze in this handsomely appointed kitchen; practical and roomy with all your familiar home appliances. A full dinner party or a simple breakfast are prepared in this modern facility with ease and convenience. 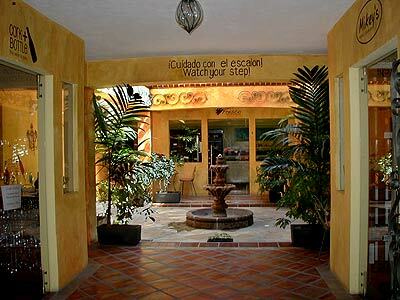 Fresh produce, fish and meats are readily available in local markets, called Mercado in Spanish. Dish washing is usually not the most envied chore in a home, but when you have a view like this at the kitchen sink... what's to be envied? If you prefer, just relax, admire the view and let the dish washer do the dirty work! You're on Vacation! 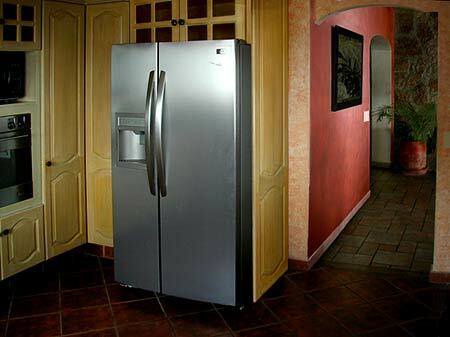 Of course the familiar appliances are here including a refrigerator with ice and cool water dispenser. In addition to the building's main water filtration system the cold water and ice dispensers on the refrigerator have their own dedicated filtration unit. 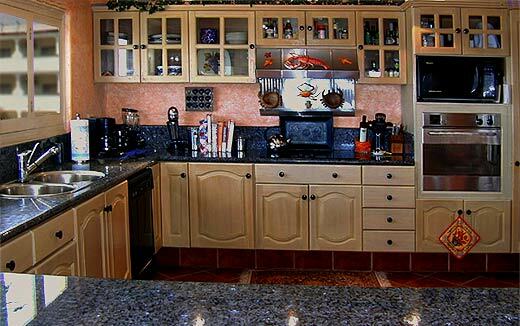 Apart from the kitchen, you will also find a washer and dryer for those quick laundry jobs that always seem to pop up. Gotta get that red wine stain, from last night's partying, out of your new shirt. 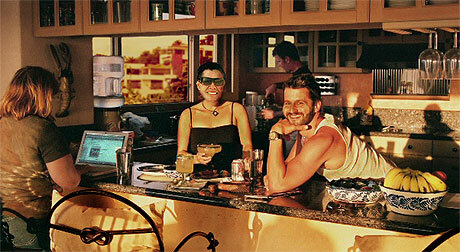 Separating the kitchen from the Dining Room is a handy counter ideal for food preparation and serving, a breakfast nook, or, following an active day on the beach or mountain trail, it's Margarita time as you are bathed in the luminous golden glow of yet another spectacular sunset. Not long after your arrival at the penthouse you will very probably discover that while the kitchen is well stocked with all manner of utensils, there is one thing amiss. 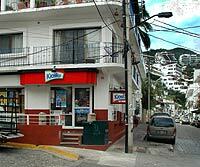 A short distance on from the Amapas market you will find two stores that closely resemble the ubiquitous US Seven/Eleven chain stores. 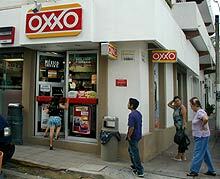 Oxxo is open 24 hours and it and Kioski serves mainly quick snacks, sodas, beverages, cigarettes and some limited lines of basic grocery items. 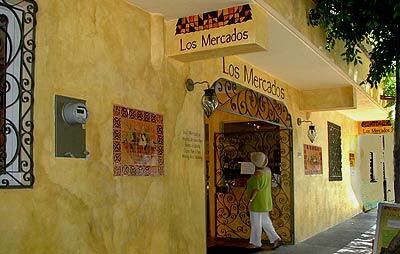 A visit to Los Mercados will reward you with an exclusive shopping experience featuring several shops offering fine foods and wines, fresh produce the way it should be, a popular delicatessen and even wine tasting events. 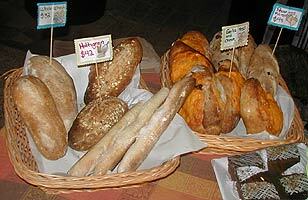 is already a "must see" and discerning shoppers relish its distinctive fare. An easy, casual walk from the Penthouse. See the map below. Within two blocks of the Penthouse you will find the Saturday Community Market, a treasure trove of fresh local produce and delicious home made breads, pastries and cakes along with condiments and many hand made items of local artisans. 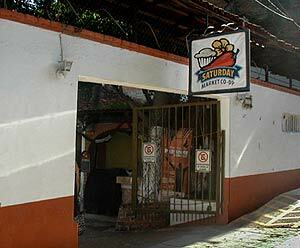 Traditional style supermarkets may be found in El Centro, the central district of Puerto Vallarta, and out along the strip to the airport. 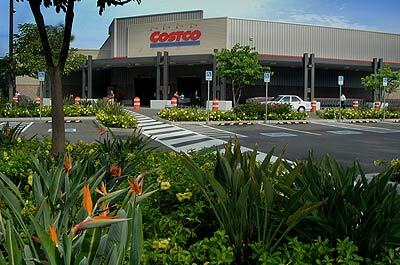 Here you will also find Walmart, Sam's Club and close to the airport, Costco. Do not attempt to walk back laden with grocery bags; taxis are usually right at the front door, and, of course, do NOT get into the taxi before you have negotiated the fare! 40 Pesos is the usual price - about $US4.00, in the Zona Romantica - the Old Town of Puerto Vallarta. Taxi fares are regulated for travel within and across zones or districts. As you explore the cobblestone streets of Old Town you will have frequent encounters with street vendors selling fresh fruits and produce, and, freshly caught fish and seafood is easily found at the Pier just a very short walk along the Playa de los Muertos beach below the Penthouse.